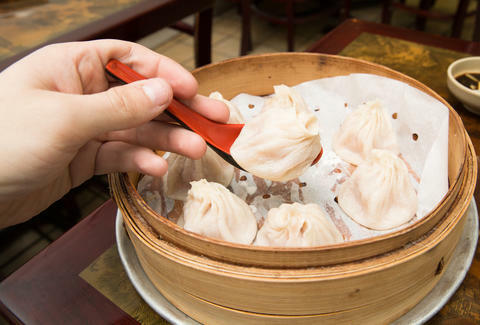 It’s not newsworthy that the ambling, fish-scented streets of Chinatown are home to some of the city’s best soup dumplings (including those at the famed Joe’s Shanghai) but it’s a lesser-known fact that Deluxe Green Bo, an austere, cash-only hole-in-the-wall, has some of the cheapest. The supremely comforting Shanghai-style version served here (called “tiny buns”) come eight to an order for just $5.25 -- a fraction of the price at Joe’s Shanghai. Deluxe Green Bo (formerly New Green Bo before it was Nice Green Bo) is a standout on narrow Bayard St despite not aesthetically standing out at all. The stark, bare-bones interior recently got a renovation -- a fresh coat of white paint under fluorescent lights -- but it’s still nothing special. Even so, the place fills up, and large parties and loners alike feast at communal tabletops and pour cheap wine from Marks Wine & Spirits Ltd around the corner (BYOB, baby) as servers, mostly curt middle-aged women speaking broken English, shuffle and shout. Go for the pork dumplings over the crab. You can watch them being assembled right behind the cash register before they’re steamed and ferried out hot on a bed of wilted lettuce in a round tin. The chewy, doughy exteriors make way to faintly sweet balls of scallion-spiced ground pork that swim inside a rich, salty broth (which will only scald your tongue if you don’t employ expert skill). Eating these is a feat, requiring deftness to dip the cargo into a soy-ginger mixture, transfer it to your miso spoon, bite off the knotted cap, blow, sip, and devour. Your efforts will be rewarded. Exiting back out into the fray, you’ll pass countless spots offering similar takes on the soup dumpling, but it’s Deluxe Green Bo, in all its frenetic and unluxurious glory, that offers a take as honest and inexpensive as Chinatown itself. Billy Frierson is an Associate Staff Writer at Thrillist, and you may or may not see him on the photo reel played on Deluxe Green Bo’s TV, holding a tea pot with crazy eyes and a maniacal grin. Follow him on Twitter and Instagram.